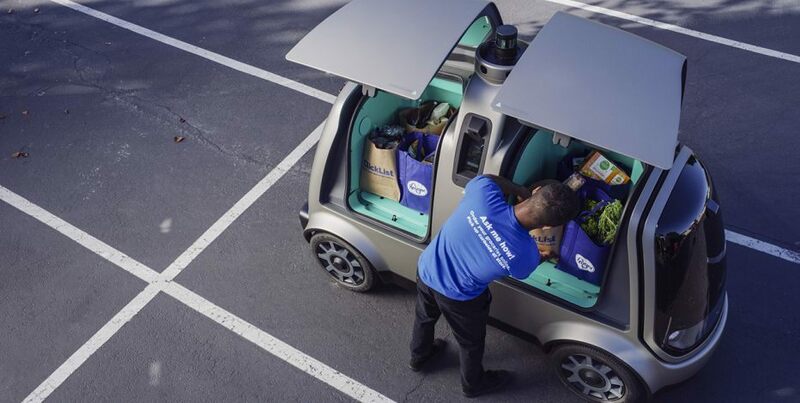 Venture Beat U.S. supermarket chain Kroger said it has started using unmanned autonomous vehicles to deliver groceries in Scottsdale, Arizona in partnership with Silicon Valley startup Nuro. Daily News The grocery chain teamed up with the autonomous vehicle maker Nuro in June and officially begin delivering groceries via robot on Tuesday. They had been testing a version with drivers since August but now have switched to Nuro’s “custom unmanned vehicle,” the R1, Kroger announced. Not much bigger than R2-D2 of the “Star Wars” franchise, the bot-cars will tool along public roads, driverless and laden only with goods, not people. "Nuro envisions a world without errands, where everything is on-demand and can be delivered affordably,” said president and co-founder Dave Ferguson in a statement. “Operating a delivery service using our custom unmanned vehicles is an important first step toward that goal." “Kroger customers are looking for new, convenient ways to feed their families and purchase the products they need quickly through services like pickup and delivery," Cosset said in the statement, adding that this would create “an ecosystem that offers our customers anything, anytime, and anywhere." The launch comes amid another set of testing elsewhere in Arizona on driverless passenger vehicles run by Waymo, the autonomous-vehicle project originally owned by Google. Those cars have been met with antipathy – run off the road, slashed, and hit with rocks, among other harassment. Nevertheless, the inexorable trend is spreading. Ford Motor Co. and Walmart are mapping out a driverless grocery delivery service in Miami, Ad Age reported last month.